“The only way to do it was to do it yourself,” says Mark Pascale, the co-curator of an exhibition celebrating the Hairy Who, a loose collective of six artists, formed out of a desire to show their work, as there were so few galleries at the time in Chicago. The Hairy Who artists—Jim Falconer, Art Green, Gladys Nilsson, Jim Nutt, Suellen Rocca and Karl Wirsum—were all former students of the School of the Art Institute of Chicago and shared an affinity for the same source material, such as comics, ethnographic art and flea market finds. They created colourful, graphic work dominated by distorted, often ribald figures. The exhibition of more than 200 objects, including paintings, sculptures and archival ephemera, marks the 50th anniversary of the group’s final show. Although they were active as a loose collective for only three years, they had a significant influence on younger artists in the city and the development of the Chicago Imagists. “They set things in motion,” Pascale says. The show also signals the Art Institute of Chicago’s mission to continue to bring their work into its collection. 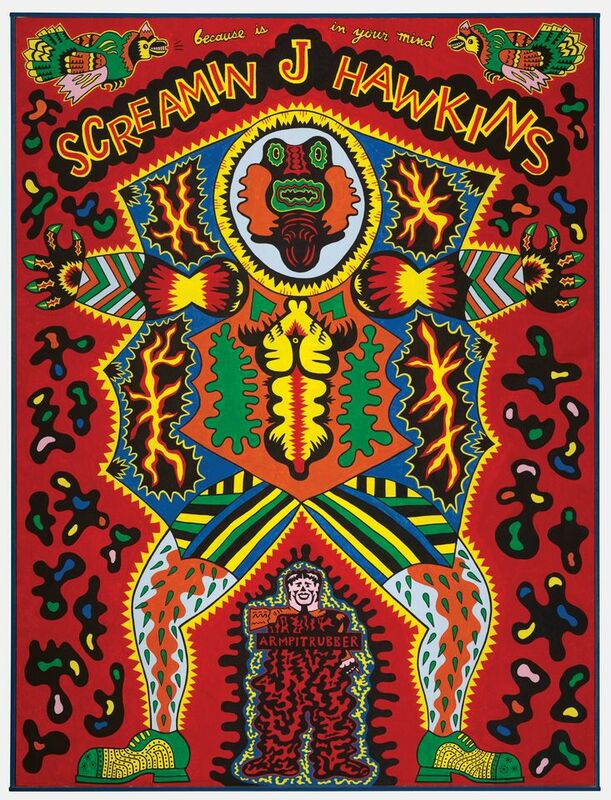 One of the works from the collection is Wirsum’s Screamin’ J Hawkins (1968). “The text at the top of Wirsum’s painting derives from his twisting of song lyrics,” says the show’s other co-curator Thea Liberty Nichols. “In Hawkins’s iconic 1956 hit I Put a Spell on You, the singer croons the haunting refrain ‘because you’re mine’, which Wirsum bends into ‘because is in your mind’. [It is] similar to the word play the artists engaged in when creating the name Hairy Who.” (The group’s name stems from Wirsum asking “Harry who?” after a raucous discussion about a local art critic called Harry Bouras). When Hawkins later saw Wirsum’s painting, he not only used it as his next album cover but adopted Wirsum’s words for its title. “So it comes full circle, with life inspiring art inspiring life,” Nichols says.